Storage West Surprise is located in the northwest section of Greater Phoenix and we serve Sun City, Sun City West, Surprise and Sun City Grand. You can find us at the Bell Road and Bullard Avenue intersection. Our facility is next door to the Shepherd of the Valley Lutheran church. We are close to the Loop 303 which makes it a quick trip to the I-10 or I-17 if you desire to travel further afield. 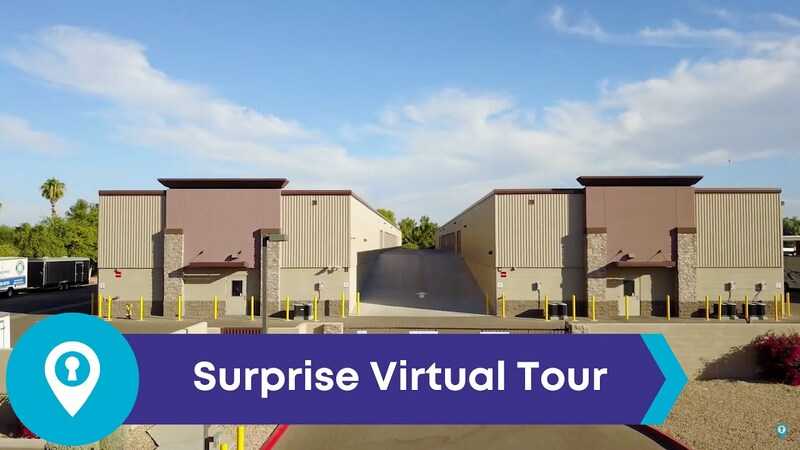 This is Storage West's Surprise/West Phoenix Self Storage location, click here to see other Phoenix self storage locations. Surprise combines traditional family dwellings and retirement communities. There is a great combination of shopping, restaurants, entertainment in this area aimed at all of these groups. At Storage West Surprise a large group of our customers are over the age of 55. They are an important part of our business and we enjoy working with them. Our facility is also great for entrepreneurs including those who are starting up their own business. We can sign for deliveries which means you don’t have to be around waiting for your UPS or Yellow Freight delivery. Our facility is modern, safe, well maintained and inviting. The aisles are wide enough to accommodate up to a 53' trailer. This makes it easy to load and unload your possessions. Storage West offer convenient air conditioned self-storage and mini-storage units, and RV, boat, and vehicle storage in Surprise with low prices for 5x10, 10x10, 10x20, and 10x30, RV, boat, and vehicle storage. We have facilities across the U.S., with many convenient locations across California, Nevada, Arizona, and Texas; so when you search for: "storage units near me," you will find a local storage facility close-by. Jen & Jerry are the best ! Made me feel right at home and work very well at getting things done fast and correct. I have been using Storage West for 7 years on a quick need basis as i travel the West Coast region. Everything was great. Level of service was outstanding. Jan 30, 2019 by David Orazio Ilardi. Great customer service provided by Jennifer and Jerry. Made our move much easier with the proper size storage space and were always available to answer any questions. Would definitely use them again if the need arises.